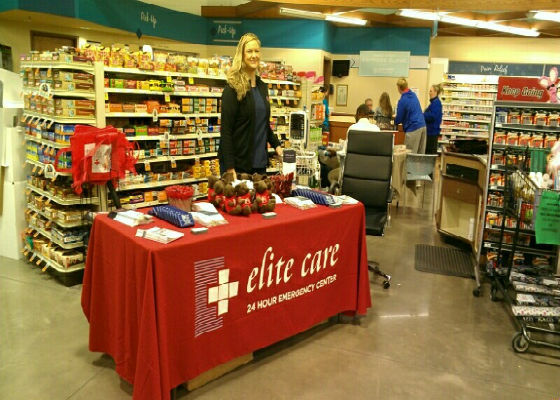 On Saturday and Sunday January 11-12, 2014 Our Elite Care location in Coppell, TX participated in the Market Street Health and Wellness Fair. This health fair was put on as a part of Market Street’s “Build a Better Basket Expo” that took place at all Market Street locations from 11 AM-5 PM on Saturday, Jan 11 and Sunday, Jan 12. The “Build a Better Expo” featured dietician-recommended products as well as complimentary blood pressure, blood sugar, and cholesterol screenings. Additionally, expo attendees were able to sample healthy foods and drinks offered at Market Street supermarkets. We were able to contribute goodie bags and offer blood pressure checks to the attendees. We enjoyed interfacing directly with the community and being asked to participate in this fantastic Market Street event.